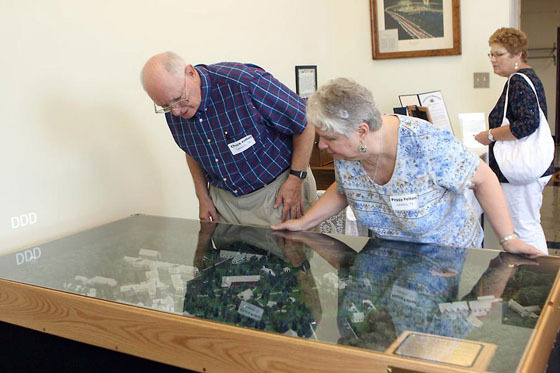 Section 1: Photos of the san scale model designed and built by Fred Conacher and his daughter Theresa McConnell along with photos of guests viewing the model at the reunion are shown below. 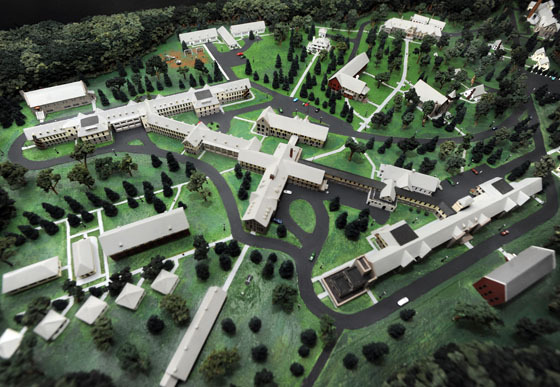 Click here to view a video of Fred being interviewed about the model at TV Station WTAJ in Altoona. Section 2: A detailed description by Fred and Theresa of the model history, design process and construction photos. Click here to view Section 2. Section 3 Theresa McConnell describes an interesting experience she had while working on the san model. Click Here To View Section 3. 1. 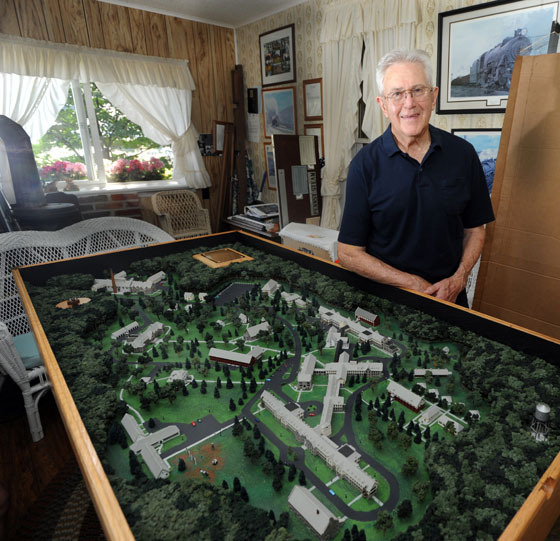 Fred Connacher and the san model at his home in Cresson, Pa.
2. Fred, his daughter and co-builder Theresa McConnell and Chuck Felton. 3. Chuck Felton and his wife Peggy admiring the model. 4. Theresa and her father Fred should be justifiably proud of their work. Their model was the focal point of all the displays and was used as a visual aid in relating many san stories. 5. Theresa, Thomas Domin who was in the preventorium and Fred. 6. The inscription on the plaque is shown above. 8. Patty Satalia of PBS Radio Station WPSU in State College interviewing Fred about the making of the model. 9. Fred, Theresa and Marcella Boruch. 10. Fred, Theresa and Chuck Felton.